This was first posted to Instagram on April 27, 2017. Submitted my thesis today. Digitally. It felt incredibly anticlimactic. 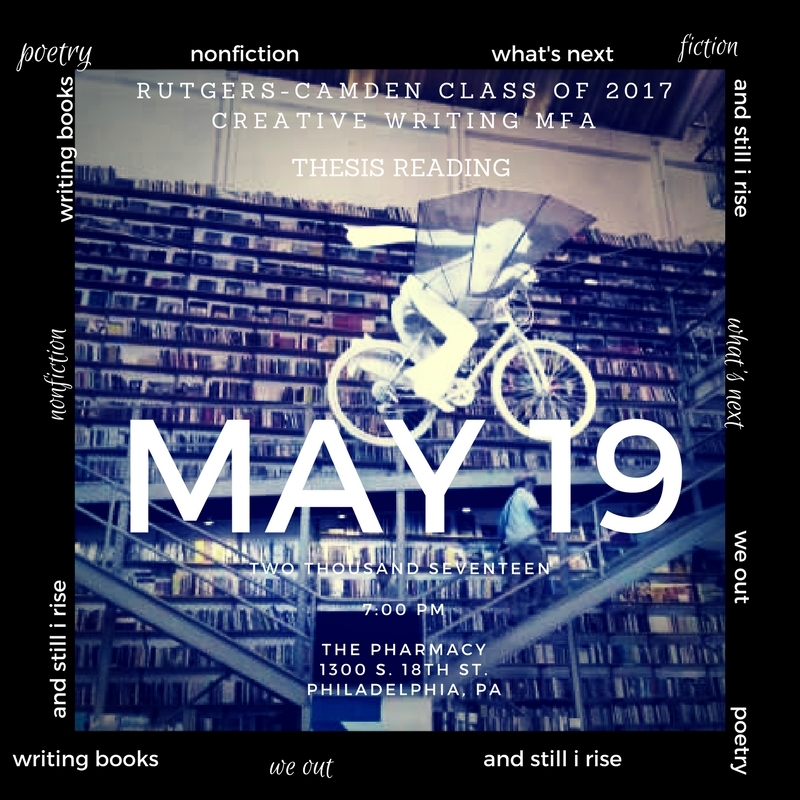 I felt better Sunday, after I made this to promote the thesis reading. Still digital but sending this out to people made me feel like I had accomplished something. Hitting “upload” and “submit” did not. Some of my apathy is exhaustion. Some of it is the intangible quality of it all. Feeling finished with a piece of writing feels different when you have a printed copy in your hands. It feels permanent. A teaching artist who had observed a workshop I did several years ago told me I should have brought clips to show the students. I wrote for a newspaper then. She was referring to hard copies of my articles, cut out from the pages of the paper–even better to bring in the whole newspaper if I had it. It would have resonated with the children, she said, to know that something written by someone they know could be that permanent. I’m not sure I’ll feel finished until it’s a book. After I told my high school students I was tired because I had finished my thesis and it was 127 pages, they, of course, lost their minds. They couldn’t imagine. That’s a book, they said. No, it’s a third of a book, I said. Although I’ve always seen the MFA as a means to an end, I hadn’t grasped that idea fully until I said it. Well, I hadn’t felt that idea. Now I’m like, all this lost sleep, quitting my job, relocating, etc., for a third of a book?! Yes. And for the skills to finish it. So a brief break from faith, family, and feminism. And then back to it. Congratulations on finishing your thesis! I understand the weird feeling of sending writing off electronically instead of having paper to hold. I wrote a poem about it once! And yes, along with the intangibility of the thesis, is the even more intangible – and even more important – skill set to finish your book, as you note. I hope that you can get some rest and peace and mental space so that more of your book will make it out onto the page, first electronically and eventually in print.